A knight of the Shadow Paladins who leads the Revengers, warriors who have sworn to protect the Sanctuary from the evil intentions of the invaders. He is a mysterious knight who suddenly appeared like a mirage, soon after the end of the Great Civil War. He sought to save the heroes from their terrible fate, acting in secret behind the scenes, but his actions were different from those of the « Black Horse Corps ». And since he acted alone, without any aid or cooperation, his reasons for doing any of this were completely unknown. In addition, according to the elves all across the Sanctuary, they’ve never even heard the name of a Knight called « Mordred » before in their lives. »Blaster Dark » appointed « Mordred » as the head of the « Revengers », trusting him completely even though they’ve barely talked to each other, but any of the specifics of -why- he did this are completely unknown. He is the Illusionary Black Knight of many mysterious with the name « Phantom ». Noone knows what his real intentions are as of now, even if you look him dead-straight in his scarlet eyes. 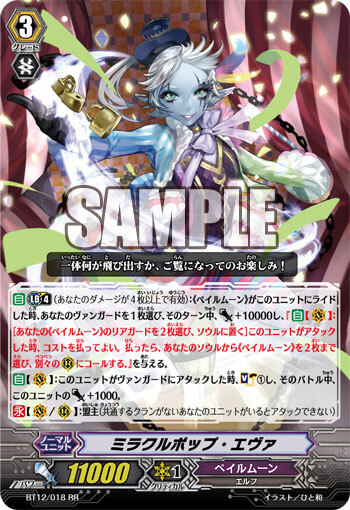 [AUTO](VC) Limit Break 4 (This ability is active if you have four or more damage):When a «Pale Moon» rides this unit, choose one of your vanguards, that unit gets [Power]+10000 and « [AUTO](VC):[Choose two of your «Pale Moon» rear-guards, and put them into your soul] When this unit attacks, you may pay the cost. If you do, choose up to two «Pale Moon» from your soul, and call them to separate (RC). » until end of turn. A pretty Dark Elf who serves as the presenter of « Pale Moon » before the start of the show. Most of Pale Moon’s cages and curtains are locked with strong sealing spells, and it’s said that the executives, session managers and female presenters are the only ones with the keys to open and unseal them. 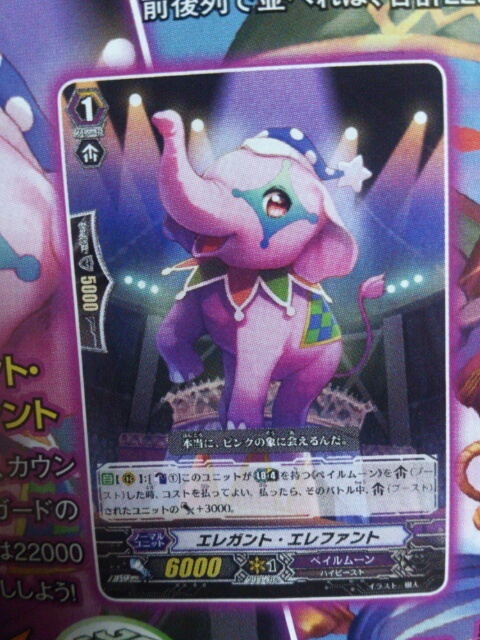 Even though she’s just recently served as one of the show’s presenters, she’s been a part of the Circus for 400 Years, starting in it as an animal and aerial acrobat, capable of perfectly handling jobs that would kill anyone who dared do them halfheartedly. As the years went on, she proved herself as a splendid performer who succeeded in everything she did, resulting in her fame with fans growing and growing. She has since stepped down from the line for the most part, she puts her heart and soul into training and following the next generation, there are these rumors that she’ll do a program or show in place of someone else, disguising herself to look like them. Of course it’s just rumors without any evidence, but yet why would there be this strange sounding truth to it all…? Deux cartes ont été révélées pour Shadow Paladin et Dark Irregulars, probablement de la BT12 mais attendons une confirmation ! Two cards have been revealed for Shadow Paladin and Dark Irregulars, probably from BT12 but we are waiting for this to be confirmed ! 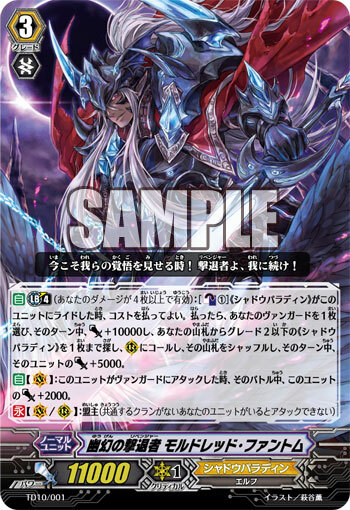 [AUTO](VC) Limit Break 4 (This ability is active if you have four or more damage):[Counter Blast (2) & Choose two of your «Shadow Paladin» rear-guards, and retire them] At the beginning of the battle step of the battle that this unit is attacked, you may pay the cost. If you do, choose one of your opponent’s rear-guards that is not boosting or attacking, and retire it. 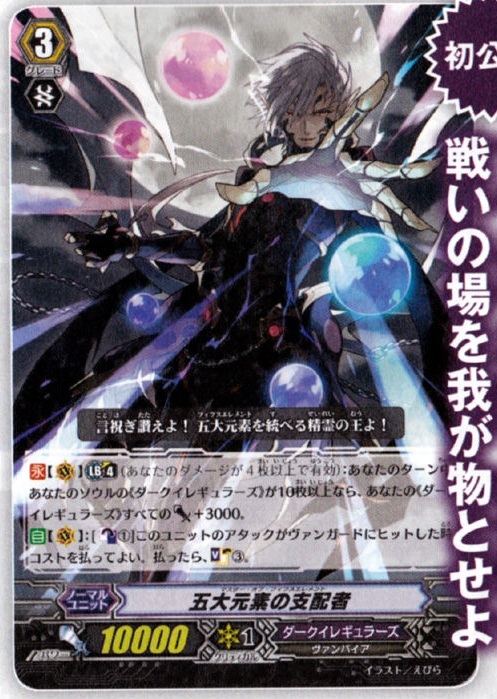 [CONT](VC) Limit Break 4 (This ability is active if you have four or more damage):During your turn, if the number of «Dark Irregulars» in your soul is ten or more, all of your «Dark Irregulars» get [Power]+3000. [AUTO](VC):[Counter Blast (1)] When this unit’s attack hits a vanguard, you may pay the cost. If you do, Soul Charge (3). 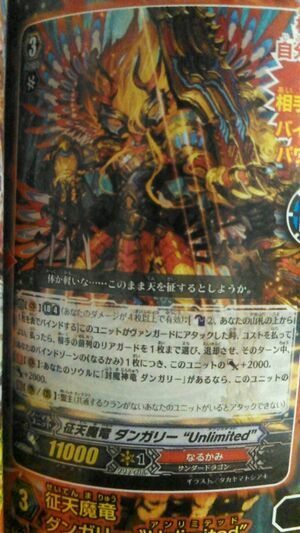 [AUTO](RC):When this unit attacks, if you have a vanguard with « Revenger » in its card name, this unit gets [Power]+3000 until end of battle. The Knight of Nullity who has been freed from the Dragon of Purgatory’s control. His true identity was a former member of the Royal Paladins, famous as the « Knight of Impermanence », who was well known for slaying the wicked without a hint of compassion in his heart or sword. The Dragon of Purgatory had its eyes on him, because of his strength, and turned him into a puppet, removing his free will. Afterwards, ashamed of his own cowardice, he left the Shadow Paladins, but continued to hunt those who would dare invade the sanctuary. As a result, he and the other Shadow Paladins ended up standing up against the strange-looking invaders known as « Link Joker ». As a result, in order to stop them, he decided to return to the Shadow Paladins, this time as a « Revenger ». But, even after regaining his will, he continues to hide his face under his mask. Having abandoned the world touched by light, leaving behind his times as a Royal Paladin, he has vowed he will spend the rest of his days as a shadow, and thus his mask is the proof of his sublime resolve as a sorrowful, empty soldier. 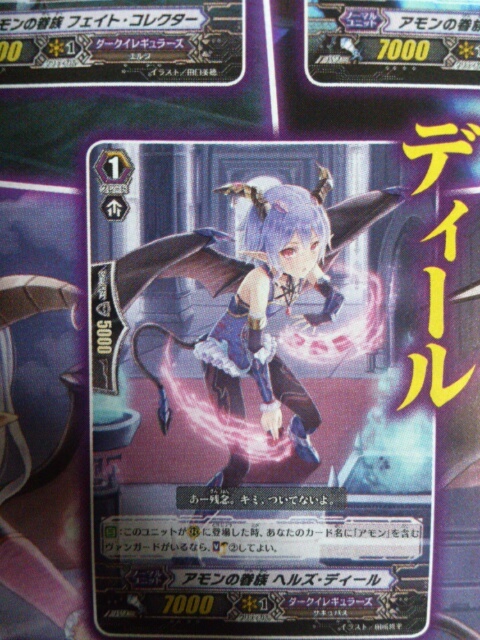 [AUTO] (VC) Limit Break 4 (This ability is active if you have four or more damage):[Counter Blast (2) & Choose a card named « Nightmare Doll, Chelsea » from your hand, and discard it] At the beginning of the close step of the battle that this unit attacked a vanguard, you may pay the cost. If you do, choose up to two «Pale Moon» from your soul, and call them to separate (RC). 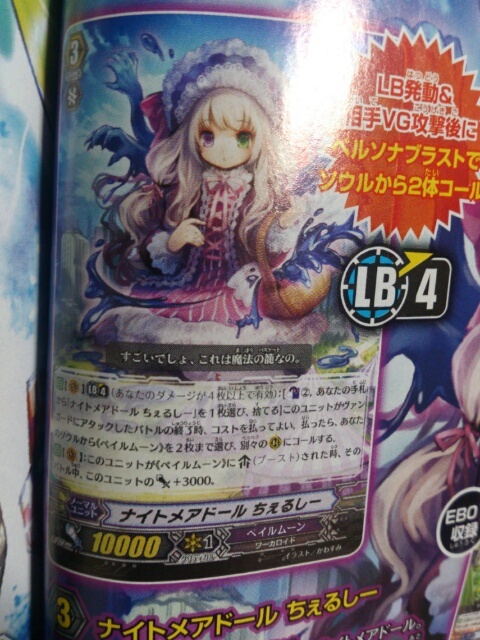 [AUTO](VC):When this unit is boosted by a «Pale Moon», this unit gets [Power]+3000 until end of that battle. An gigantic automaton that recently joined the « Pale Moon » Circus. The basket she carries with her is the man-made magical device called « Hell’s Basket », which isn’t a part of her and is powered by powers that was extracted from psychics. As a result, she’s more fuel efficient than other Nightmare Dolls that use magical energies whenever they use their abilities. Because she was made as the means to control the endless liquid monstrosities created by her magical tool, her body isn’t designed to handle combat terribly well and she’s shorter than most. However, because the amount of work put into her appearance and what not has been reduced, she’s in a far better position than the others, because as a result the time needed to repair her using delicate magics has been greatly reduced. She is a mechanical automaton, one of the Nightmare Dolls. An artificial maiden given a transient heart and soul inside a cold hard body. In the reckless circus troupe, these days, she moves serenely, showing off stoically. 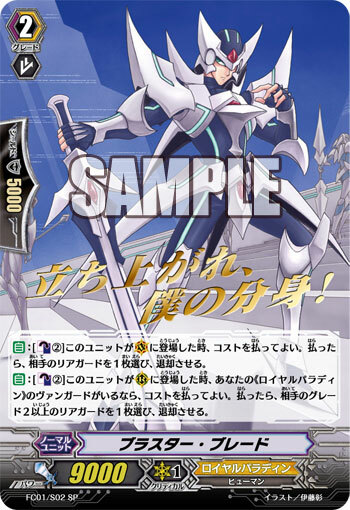 The hero of the shadows who was key to the awakening of the Vanguard « Blaster Blade », he is one of the knights of the formless black knights: « Shadow Paladin ». Along with the warriors of the rebuilt Shadow Paladins, he continued to protect the Sanctuary in secret, but in an encounter with a mysterious warrior possessing unknown technologies, he was barely able to repel them. Sensing the evil ambition of the invaders that were quickly approaching Cray, he established the « Revengers », a team specializing in repelling the Invaders, making « Mordred » their leader, while he took up the position of the group’s right hand man, and started acting by investigating the trends and movements of the invaders. He doesn’t expect praise, honor or glory or anything banal like that. All he cares about is fighting for his homeland that has been exposed to one crisis after another… … And in order to make sure he never repeats his mistakes again, the Knight of Resolve walks down the path that lays before him. [AUTO]:[Counter Blast (2)] When this unit is placed on (VC) or (RC), if you have a vanguard with « Liberator » in its card name, you may pay the cost. If you do, choose one of your opponent’s rear-guards in the front row, and retire it. The hero who at one time awakened as the legendary « Vanguard », he has since been made a knight in the Sanctuary’s second standing army: « The Gold Paladins ». Despite his glorious return as the Knights’ greatest swordsman and being a part of the original army, in response to the wishes of his friend, the King of Knights, and having been bestowed the title of « Liberator », he transferred to the Gold Paladins. Fulfilling his duty as the right-hand man of the King of Knights, he spends day-in and day-out teaching the inexperienced young warriors, and despite all this, he still keeps up on his own training. In hindsight, this was a keen decision, as he might of been sensing the unease beginning to spread across Cray once more. Going with the King of Knights to « Genesis », what awaited the two of them was a vision of the future.. .. … It was an image of the whole of Cray fallen into the darkest depths of « Despair ». Carrying the sword of courage in his hand, the hero of light once again plans to expel the looming threat, and change the future of despair into a future of hope. The elite knight of United Sanctuary’s standing military « The Royal Paladins ». He is a friend and right hand man of the great King of Knights, « Alfred ». Since he was the only one among the Paladins who was capable of fully utilizing the might of the Sword-Type Weapon « Blaster Blade », which can transform power into courage, he was given the glorious title of that blade as his own. The hero of the holy nation, « United Sanctuary », he is a knight of the light with a heart of justice and inexhaustible courage. During a fight against a powerful foe, he awoke even greater power inside himself, becoming the legendary « Vanguard » said to be able to lead all the people on the planet Cray. However, he was taken surprise by a mysterious force that suddenly attacked from another dimension, and was sealed in an unknown dimension along with the two other legendary heroes. As a result, the Gold Paladins are trying to help them. Meanwhile, the Dragon Empire has taken different actions, but with the same purpose. Meanwhile, the ancient navy has been investigate the situation thoroughly. The end is finally coming for this battle of different desires and expectations, that has come be known as « The War of Liberation ». 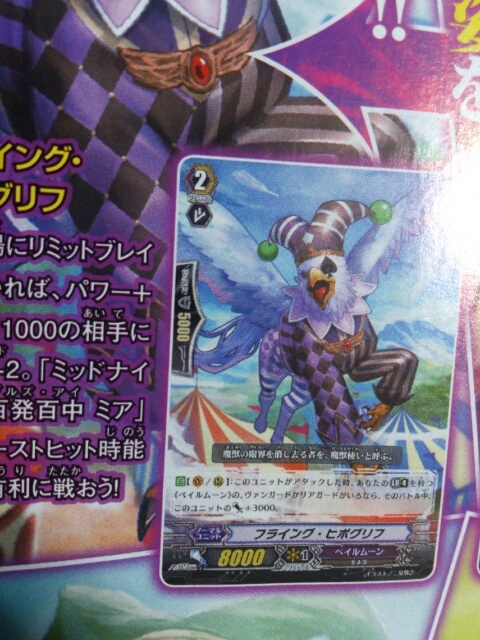 [CONT](VC):If you have a card named « Blaster Javelin » in your soul, this unit gets [Power]+1000. [AUTO]:[Counter Blast (2)] When this unit is placed on (VC), you may pay the cost. If you do, choose one of your opponent’s rear-guards, and retire it. Incapable of demonstrating the strength needed to wield the Sword-Type Weapon that can change courage into power, this man ended up walking the road of evil, pushed by the intensifying of negative emotions inside his heart. His malice and hatred for the man who took on the name of « Blaster Blade » flowed into a dud of a weapon, which resulted in those emotions twisting the entire nature of the weapon itself. Taking on the name « Blaster Dark », in the name of the Dragon of Purgatory, he seeks to settle the chain of cause and effect with that man. The Warrior who left the standing army « Royal Paladins » for the knights of the shadows, « The Shadow Paladins ». Obsessed with the man « Blaster Blade », he held an intense grudge against him, but they ended up reconciling with one another in a duel during the Great War. 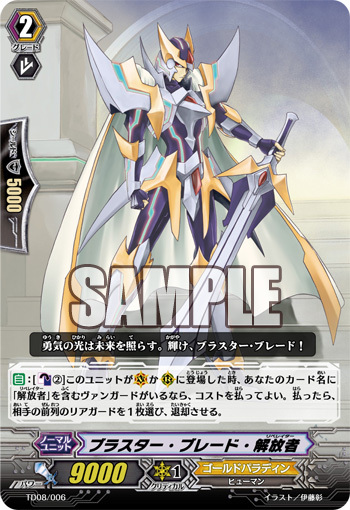 In order to stop the Dragon of Purgatory, who showed his true colors, from dragging Cray into chaos and mayhem, he temporarily entrusted « Blaster Blade » with his own sword, the most important thing in the world to him. Watching the legendary Hero from the shadows, his actions became the thing that allowed for the awakening of « The Vanguard ». After the Great War, he sought to rebuild the « Shadow Paladins », striving to deter some of his men from falling back into old habits, but he ended up being sealed in an alternate dimension due to the power of a mysterious force that feared the awakening of « The Vanguard ». Et voici la vague du mois, Shadow Paladins au menu ! And here is the month’s wave, here are Shadow Paladins ! 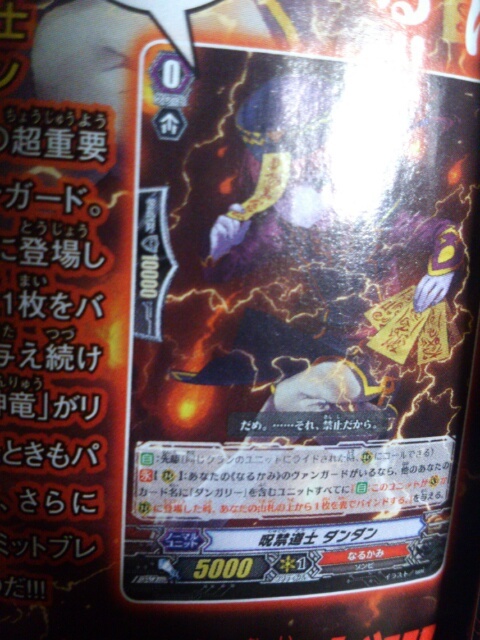 [AUTO] Limit Break 4 (This ability is active if you have four or more damage):[Choose three of your rear-guards with « Revenger » in their name, and retire them] At the beginning of the close step of the battle this unit attacked, you can pay the cost, if you do, choose up to 1 « Revenger, Raging Form Dragon » from your hand and ride it as [Stand], choose one of your Vanguards, and it gets [Power]+10000 until the end of turn. [AUTO](VC):[Counter Blast(1)] When this unit attacks, you may pay the cost, if you do, this unit gains [Power]+3000 until end of that battle. 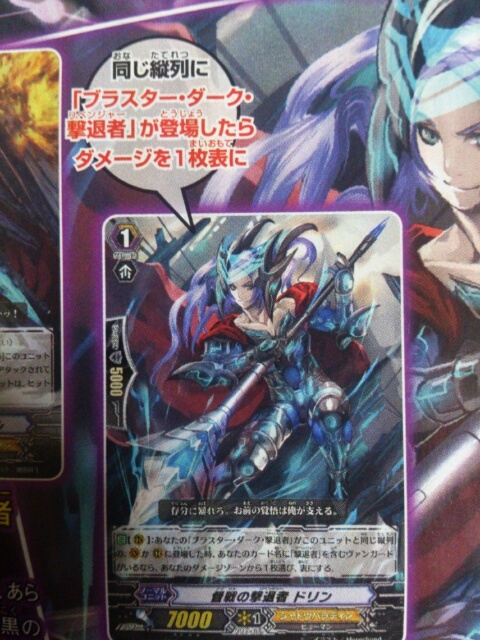 [AUTO] [Counter Blast (1)] When this Unit appears in the Vanguard or Rearguard Circle, if you have a « Shadow Paladin » Vanguard, pay the cost. If you do, look through your Deck for up to 1 Grade 0 « Revenger » Card in your Deck, call that Unit to a Reaerguard Circle in Rest, then shuffle your Deck. 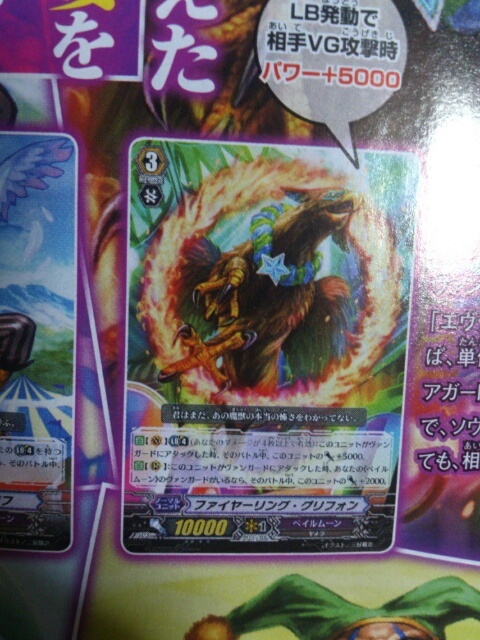 [AUTO](RC): [Soul Blast (1)] When this Unit boosts « Revenger, Raging Folm Dragon », you can pay the cost. If you do, the boosted Unit gains an additional 5000 [Power]. 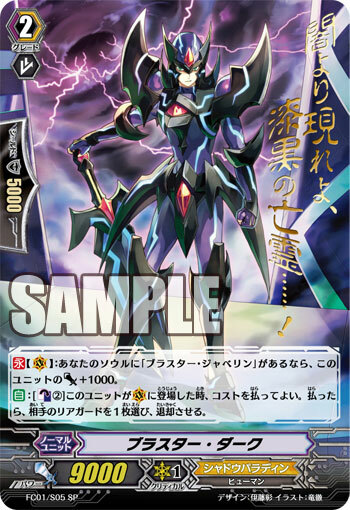 [AUTO]: When this Unit appears in (VC) or (RC) that happens to be in the same Column as « Blaster Dark Revenger », if you have a « Revenger » Vanguard, choose 1 card in your Damage Zone, flip it up. 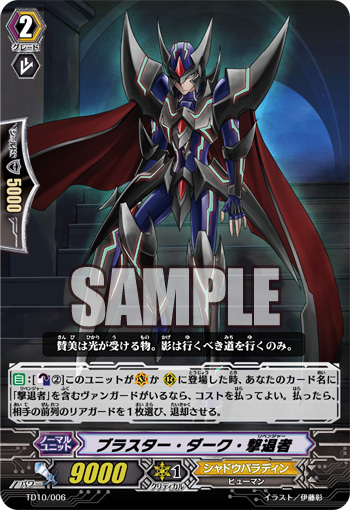 Activate (RC): [Counterblast (1), Place this Unit in your Soul] If you have a Grade 3 or higher « Shadow Paladin » Vanguard, search your Deck for up to 1 « Blaster Dark, Revenger », call it to a Rearguard Circle, then shuffle your Deck. 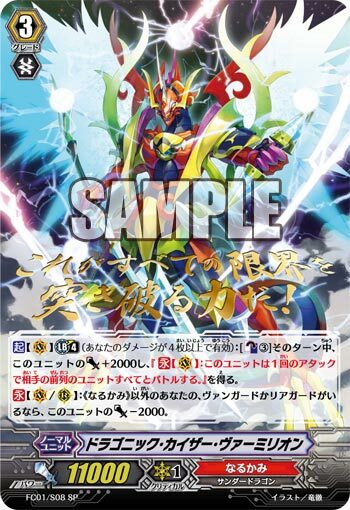 [AUTO](RC):[Put this unit into your soul] When an attack hits a vanguard during the battle that this unit boosted a «ShadowPaladin» that has Limit Break 4, you may pay the cost. If you do, draw a card. 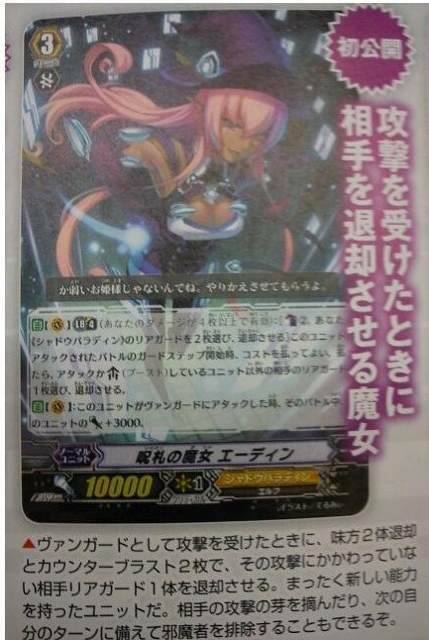 [AUTO](RC): When a Grade 3 « Shadow Paladin » appears in the Vanguard Circle, this Unit gains +10000 [Power] this turn. 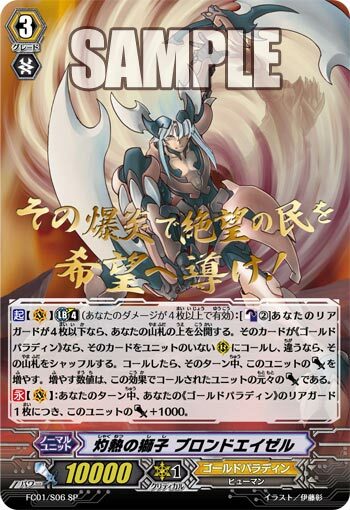 [AUTO]:[Choose a «Shadow Paladin» from your hand, and discard it] When this unit is placed on (GC), you may pay the cost. If you do, choose one of your «Shadow Paladin», and that unit cannot be hit until end of that battle. [AUTO](VC/RC): [Counterblast (1) « Shadow Paladin »] When this Unit attacks, if you have a « Shadow Paladin » Vanguard, you can pay the cost. If you do, this unit gains 4000 Power this turn. 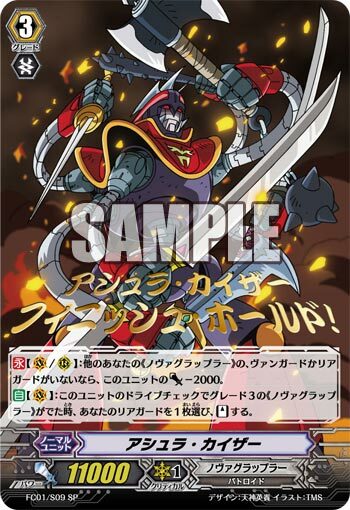 [AUTO](VC) Limit Break 4 (This ability is active if you have four or more damage):[Counter Blast(2) & Bind one card from the top of your deck] When this unit attacks a vanguard, you may pay the cost. 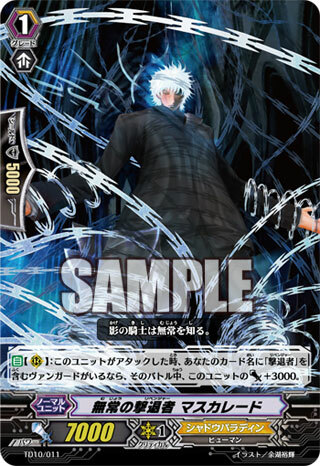 If you do, choose up to one of your opponent’s rear-guards in the front row, retire it, and this unit gets [Power]+2000 for each «Narukami» in your bind zone until end of turn. 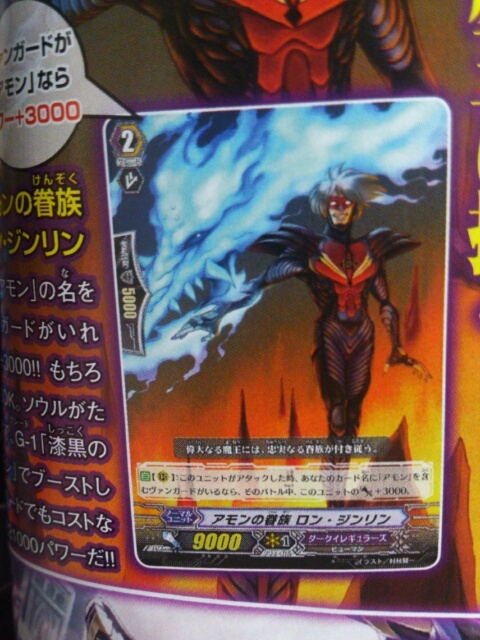 [CONT](VC): If you have a card named « Sealed Demon Dragon, Dungaree » in your soul, this unit gets [Power]+2000. [AUTO](RC): [Soul Blast (1)] When this Unit Boosts a Unit named « Dungaree », you can pay the cost. If you do, the boosted Unit gains +6000 [Power]. [CONT](RC): If your Soul has 6 or more « Dark Irregulars » in it, this Unit gains « Auto (R): [Place this Unit in your Soul] At the end of a Battle in which this Unit boosts a « Dark Irregulars », you can pay the cost. If you do, draw 1 card. 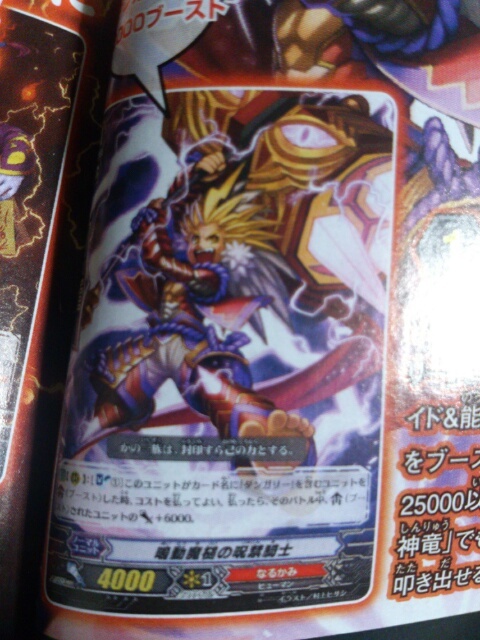 [AUTO]: When this Unit appears in (RC), if you have an « Amon » Vanguard, Soul Charge (2). 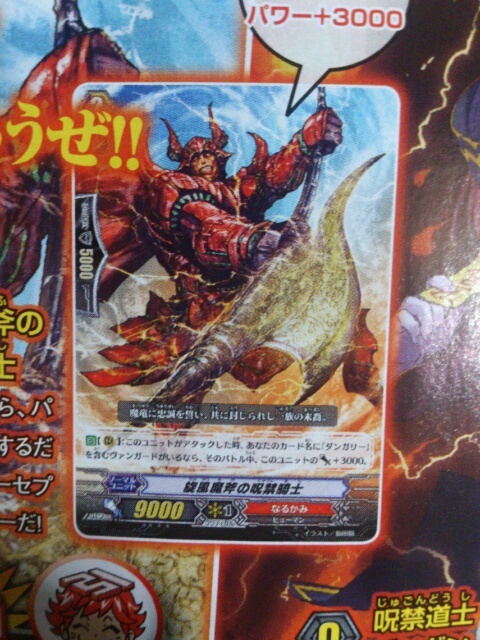 [AUTO](RC): When this Unit attacks, if you have a « Amon » Vanguard, this Unit gains +3000 [Power] during that battle. 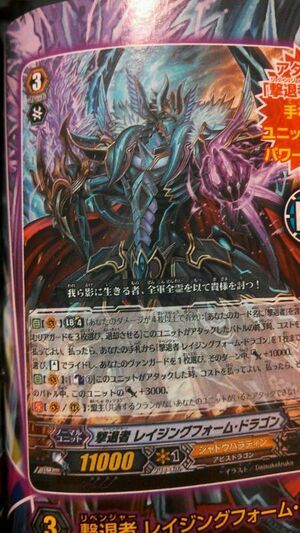 [AUTO]:[Choose a «Dark Irregulars» from your hand, and discard it] When this unit is placed on (GC), you may pay the cost. If you do, choose one of your «Dark Irregulars», and that unit cannot be hit until end of that battle. 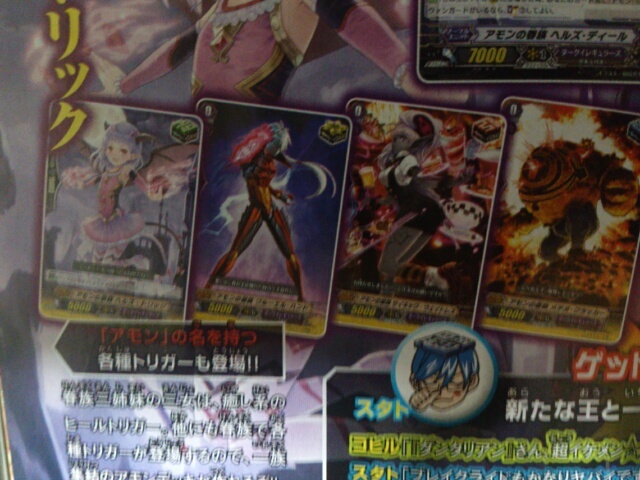 [AUTO] Limit Break 4 (This ability is active if you have four or more damage):When a «Dark Irregulars» rides this unit, choose one of your vanguards, and that unit gets [Power]+10000 until end of turn, and gains « Auto (VC): [Choose 2 of your « Pale Moon » Rearguards, place them in the soul, when this Unit attacks, pay the cost. If you do, Choose up 2 « Pale Moon » in your Soul, and call them to seperate Rearguard Circles. 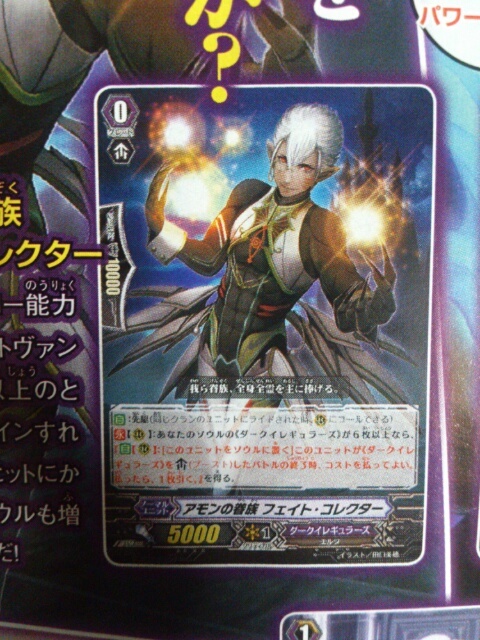 [AUTO](VC): When this Unit attacks the Vanguard, Soul Charge (1), this Unit gains +1000 [Power] during this Battle. 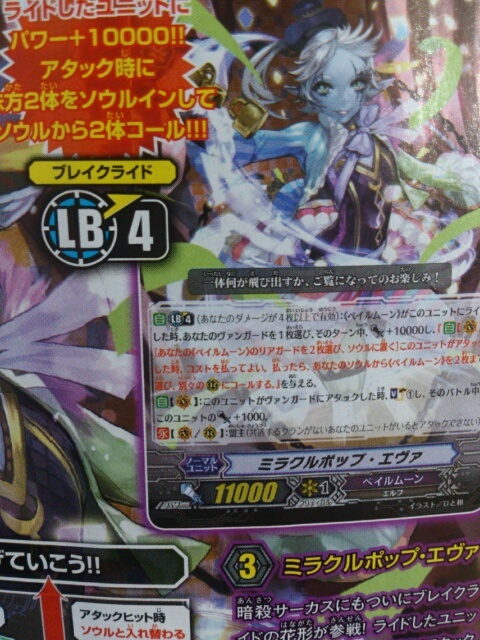 [AUTO](RC):[Counter Blast (1)] When this unit boosts a «Pale Moon» that has Limit Break 4, you may pay the cost. If you do, the boosted unit gets [Power]+3000 until end of that battle. 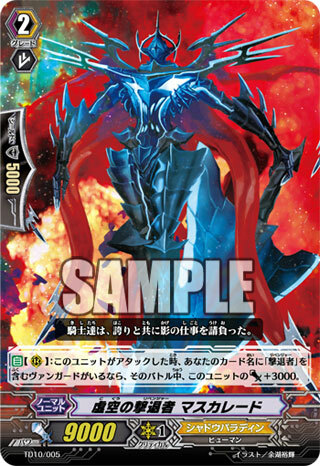 [AUTO](RC):[Put this unit into your soul] When an attack hits a vanguard during the battle that this unit boosted a «Pale Moon» that has Limit Break 4, you may pay the cost. If you do, draw a card. 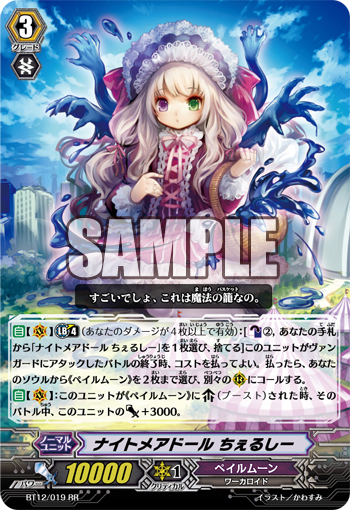 [AUTO](VC) Limit Break 4: [Counter Blast (2), Choose 1 « Nightmare Doll, Chelsie » in your hand, discard it] At the end of a Battle in which this Unit attacks a Vanguard, you can pay the cost. If you do, choose up to 2 « Pale Moon » in your Soul, call them to seperate Rearguard Circles. 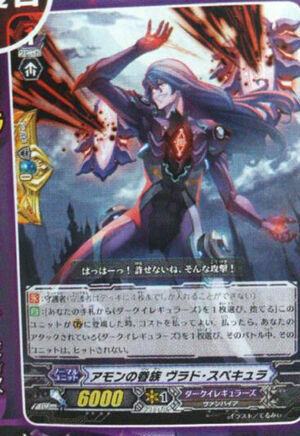 [AUTO](RC):When this unit attacks a vanguard, if you have a «Pale Moon» vanguard, this unit gets [Power]+2000 until end of the battle. 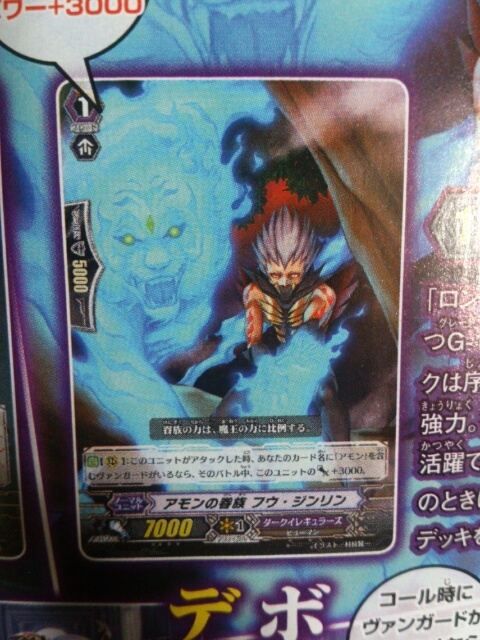 [AUTO](VC/RC):When this unit attacks, if you have a «Pale Moon» vanguard or rear-guard that has Limit Break 4, this unit gets [Power]+3000 until end of that battle. The heir entrusted with the Armor of the Red Lion, he has a burning fighting spirit. He commands the Gold Paladin’s Red Lion Corps. He has the personality of someone already quite accomplished from having served in the Royal Paladins, but tends to speak rather arrogantly as if trying to imitate a state of majesty or solemn authority. Naturally, those he’s handpicked to work under him are friends, comrades, and subordinates that he wants to fight with side-by-side, and this way of fighting is able to keep despair from consuming the hearts of people, which remains constant. The Incandescent Lion allows one’s soul and spirit to burn up and ignite, allowing them to pierce and shatter the limits. The roar of the lion becomes the prelude that clears the way to an era of new warriors ready to fight. One of the 7 « Gold Paladin » corps who use the symbols of the 7 Sacred Beasts said to protect United Sanctuary. The Red Lions in particular consist of warriors who specialize in combat, especially frontal assaults. Since many of their members were not originally Knights, many in the ranks are prone to having rough personalities and nasty tempers and tend to act on their own, but they also happen to be the group with the most victories out of all 7 Corps. Those who have been saved or defeated by « Ezel », their current leader, while their reasons may vary, they tend to gravitate towards of him, in hopes of an assignment, and as a result the bond between master and servant runs much deeper than in the other Corps. 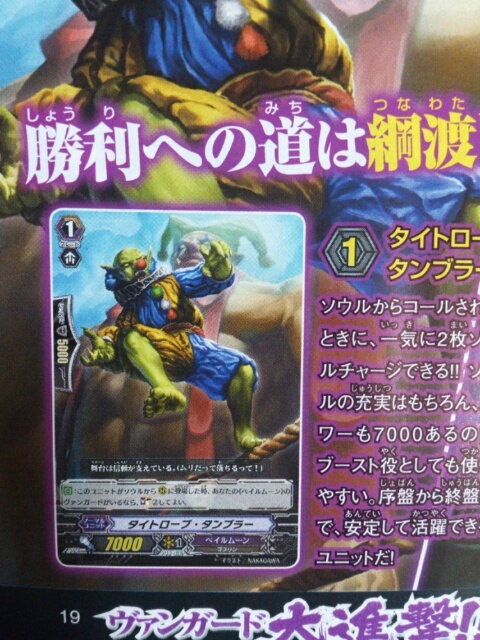 [ACT](VC) Limit Break 4 (This ability is active if you have four or more damage):[Counter Blast (3)] Until end of turn, this unit gets [Power]+2000, and battles every unit in your opponent’s front row in one attack. The commander of the First Air Strike Division « Narukami ». 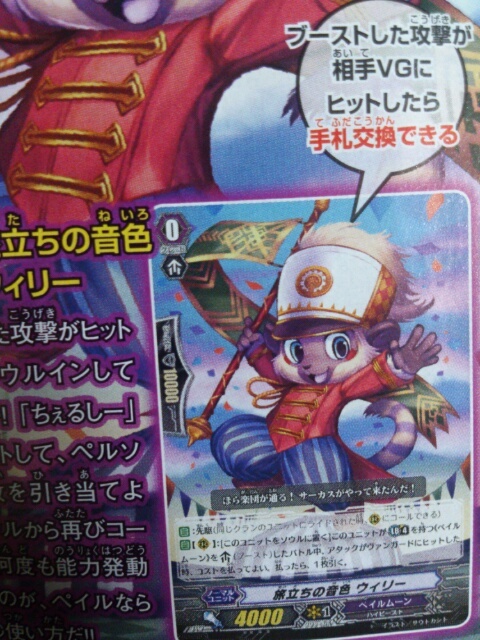 Bearing the title of « Kaiser », he is said possess the powers that are expected of the reincarnation of the ancient dragon emperor. Everyone admits he is the strongest soldier among the ranks, with power that is equal to, and some say even greater than, that of « Dragonic Overlord » himself. He hates being on center stage and prefers to attack from behind the scenes, but when he became a part of « Narukami », he was put in an unusual situation where he’s now forced to stand out in the front of the battlefield. The violent attack of his roaring red thunder « Vermilion Thunderbolt » is reminiscent of the apocalyptic lightning that rained down upon « Cray » in ancient times long since lost to the sands of history, driving every possible meaning of despair into all enemies who stand before him. 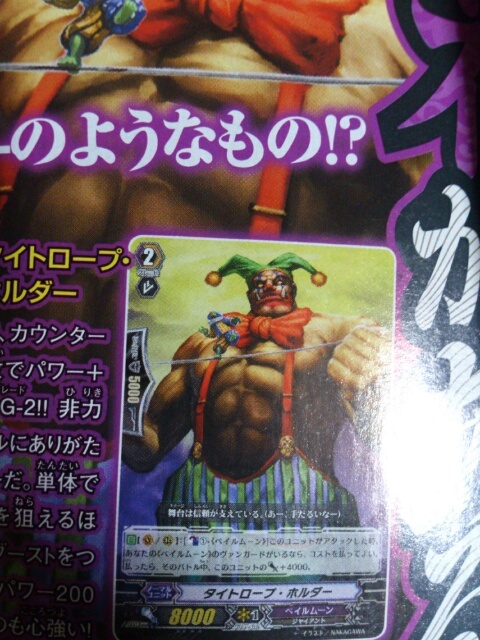 [CONT](VC/RC):If you do not have another «Nova Grappler» vanguard or rear-guard, this unit gets [Power] -2000. [AUTO](VC):When this unit’s drive check reveals a grade 3 «Nova Grappler», choose one of your rear-guards, and [Stand] it. The reigning champion of the Nova Grappler league who is known as an undefeated, invincible fighter. He’s a mighty warrior who can hold their own in even one-vs-many handicap matches. With its six multi-joined arms, it’s capable of impossible movements, which allows it to perform the « Kaiser Buster », an all-or-nothing attack with insane destructive power that is basically a hundred killing moves in one. It’s said he refuses to have any scars repaired. Those countless scars are proof of the battles against every single person he had to fight to reach the top. [AUTO](VC/RC):[Soul Blast (8) & Counter Blast (5)] When this unit’s attack hits, you may pay the cost. If you do, draw up to five cards. 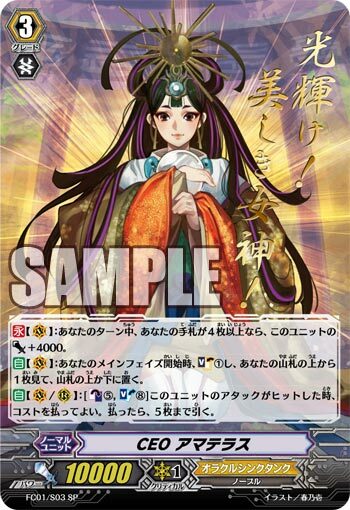 The Sun goddess who is also the CEO of the Mega Corp « Oracle Think Tank » whose name is known in every nation across the entire planet. With dignity and charisma appropriate for a goddess of her high rank, she is both gentle and kind, never forgetting a kind heart, always making sure to thank her employees, to the point she receives looks of trust and respect from those around her, whether or not they’re inside the company. Not many in the public know it, but she takes care of every one of the Royal Paladins whose spirits fell, and continues to support even the Gold Paladins. Just like her divine treasure « Yata-no-Kagami » that emits sunlight that the darkness can never swallow, there is nothing in the world that can swallow up her smile. As the embodiment of the sun, you know she’s a savior because of the light she emits from her own body.